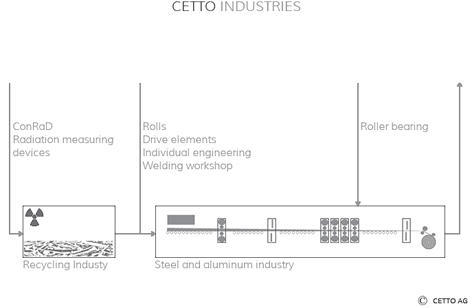 Cetto AG is situated in Ratingen and has been working with main focus on customers in the steel and recycling industries at national and international levels for over 90 years as a family enterprise. As a family business we made the decision to react with flexibility to the requirements of our customers and the challenges in the market. A family business needs to think sustainably and should care about the needs of future generations. This reflects in our products: high quality and competence in manufacturing and reparation contribute to the longevity of our range. Today’s society is aware of our social obligations. We fulfill these responsibilities through individual care, by engaging in the eco-profit program (Ökoprofit) and by implementing the occupational health & safety guidelines of the trade association “Sicher mit System”, meaning Safe with System. Furthermore we support regional and international initiatives (in line with our possibilities) who campaign for cultural and peacekeeping missions.